Filming went great. The lighting was spot-on, the audio clear as can be, and you’re confident your audience will be thrilled about this launch. Making Stories is one of your favorite aspects of content creation, and you look forward to sharing with your followers every day. That’s why when you start to measure your Instagram Stories performance, you’re stoked to dig into the numbers. But what happens if the data doesn’t look so good? If you’re concerned your Stories are performing poorly, keep these data points and tips in mind. Before diving in, you’ll need to access your Stories metrics first. 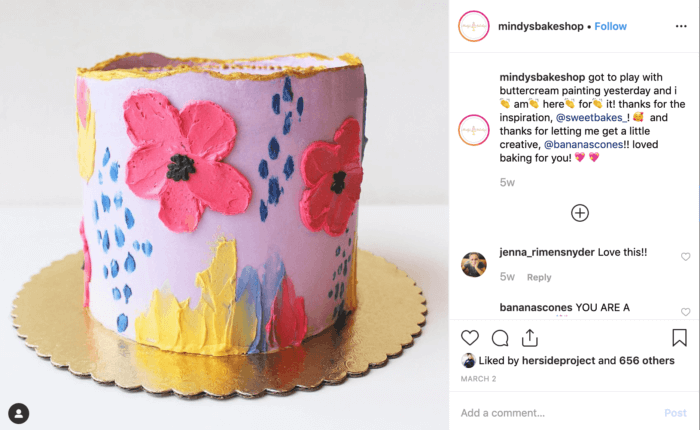 Instagram Insights, required to access in-depth Story data, is only available to Instagram business profiles or verified accounts. Once you meet that criteria, you can find your stats for the last two weeks within the app’s native platform. Of course, if you’re anxious to see all your Instagram Stories performance stats in one spot, you can always start a free trial or access Instagram Insights in your existing account in Rival IQ. Instagram Stories Performance Problem #1: My feed photos receive way more engagement than Stories. You’ve always loved sharing Instagram photos for your business, and Stories are no exception. It goes without saying that you want all content to be seen. While we always want to maximize exposure, our research reveals that it’s normal for the majority of your followers to see your posts more often than your Stories. Smaller handles (with 10K followers or fewer) reach 32% of their followers on average. For those handles with 200K or more followers, only about 17% of their followers see their posts, on average. Hopefully, this dilemma won’t be a problem for much longer. According to Facebook CEO Mark Zuckerberg, Stories are set to outpace the Feed in the algorithm sooner rather than later. Until then, it’s worth making a significant investment in this part of the platform. Why? Stories serve as an incredible opportunity to meaningfully connect with the followers who are watching, which can skyrocket customer loyalty. This is especially true for small businesses. For example, I follow @mindysbakeshop, an Austin-based cake and cookie pastry chef. I first discovered her when friends invited me along to take her cookie decorating class. We had such a fun time, I started following her on Instagram (for the record: watching a professional decorate cookies is absolutely mesmerizing). Mindy posted pictures from our class and I responded to let her know we loved every minute. She then responded, thanking me for attending. The Instagram algorithm is designed so that the more someone watches your Story, the more often you’ll appear in their Stories shortlist. So, ever since, Mindy’s Stories bubble is nearly always visible when I open the app. One year later, thanks to our ongoing engagement, Mindy was top of mind when it came time for me to order a cake for my daughter’s first birthday party. I contacted her through Instagram and she was off to the races making one of her famous themed cakes for the affair. Just think: if I hadn’t stayed in touch with Mindy via Instagram, specifically through Stories, I may not have thought of her when I needed dessert. Promote on your Feed. You can’t expect followers will just stumble upon your Stories, or specifically seek yours out. If more people see your normal Instagram photos, take the opportunity to encourage people to watch your Stories. One idea is to spread the word from your feed that you’ll soon be making an important announcement, but let people know you’ll only be sharing via your Story later. Don’t create in a vacuum! Beyond the Instagram post, spread the word that people should check out your Stories on email, your website, and other messaging avenues. The farther and wider you cast your net, the more awareness you’ll generate. Instagram Stories Performance Problem #2: Only a fraction of my total audience watches my Stories. Don’t despair if you’re disappointed in the amount of Story views relative to your total number of followers. Between the algorithm and today’s instant gratification society, it’s hard to earn and keep someone’s attention. Instead of focusing on the views you don’t have, your energy is much better spent focusing on the views you DO have. 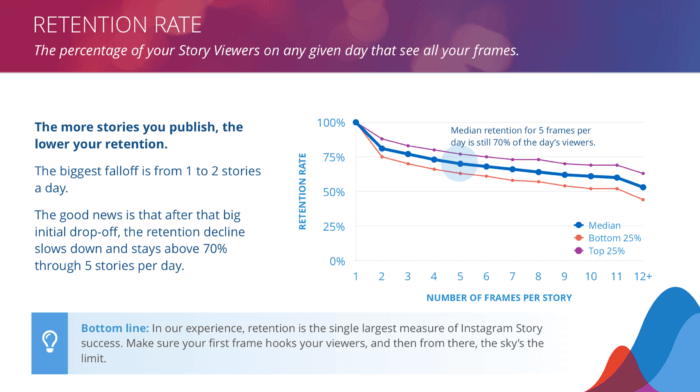 Retention rate, or the percentage of your daily viewers that see all of your published frames, is an excellent metric to see who is viewing your Stories, and making it all the way through. These people are important, and content should be tailored to their wants, needs, and preferences. If you’re wondering if your retention rate will suffer if you publish too many Stories, the answer is no. In the graph above, we can see that, on average, brands are losing about 20% of their audience moving into the second frame of the day. Though that might seem like a big deal, the good news is that the audience fall-off from there isn’t nearly as sharp. Even at five frames per day, the retention rate stays above 70%. Make sure your first frame hooks your viewers, then feel free to post as much engaging content as you’d like! 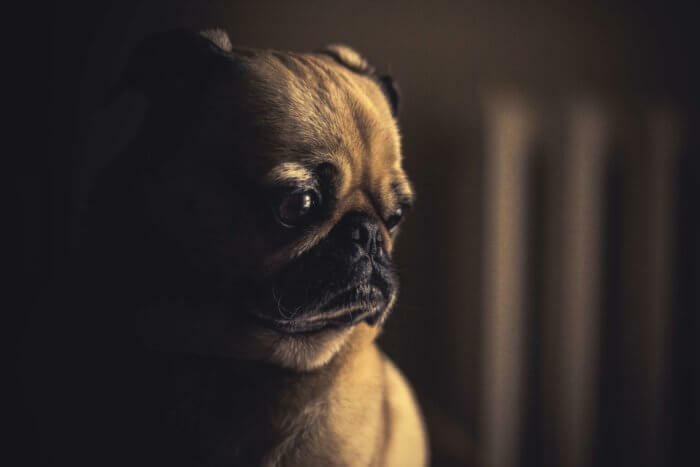 Do you feel like this poor pup? Don’t be sad if people aren’t messaging you left and right. While direct messages are a clear indication that your content resonated with a viewer, they’re less common than you might think. In fact, the average brand gets a reply from just 0.00016% of viewers–that’s 1.6 of every 10,000 people that see their Story! Is my content engaging? If you’re not receiving DMs or many views, take a moment to analyze your follower’s behavior. If they’re tapping forward or exiting mid-Story, that viewer has probably seen enough of the content or wasn’t interested in the first place. Make sure you know your audience to tailor content for their experience. Also, incorporate more videos to address the tap-forward issue. Since videos keep moving, it can keep your audience’s attention longer than a static image that remains on the screen for five seconds, often prompting a skip. Am I approachable? Am I giving my viewers a reason to reach out? For many people, sending a stranger a DM is intimidating (yes, even if the account is an influencer or a brand). Break the ice by encouraging responses. Simply ask for feedback, or create a poll (my personal favorite). It’s all about quality over quantity. When you do start to see an uptick in responses, make sure you reply back to every message. Taking a few seconds to personally respond goes a long way in relationship building. While this data about Instagram Stories performance may surprise you, the numbers don’t lie. Even though Stories have been around for a while now, we’re still in the early days of leveraging this platform for digital marketing. If you think your Instagram Stories performance can improve, don’t beat yourself up! Instead, focus on thoughtfully creating content that speaks to your target audience. Also, if you’re ready to see how you measure up, feel free to download a copy of our Instagram Stories Benchmark Report that you can consult anytime.